Oh, don't be sad. We can always try and find some incriminating photos of Ivan Derzhanski and blackmail the IOLing Board into putting the Proto-T1 as the Team Contest problem. I'm not sure if I'd be more interested in seeing the latter or the former. Might even ha*ahem* some semi fitting material for the former. But I'd also like to see reconstructing the entirety of Proto-T1 in four hours. At this point it's probably the best option we have really, given that there doesn't appear to be much willpower for it on this board despite how wonderful the languges are *my own personal opinion*. So yeah I've sketched out the bones of a descendant of Proto-Muyan which I'm happy to throw out to anyone who wants it. Nice; looking forward to seeing more. Looks a bit like it could be distantly related to the T1 languages FWIW (although this is less so for Proto-Muyan, so the comparison is probably moot). One question though: In the verbal person-marking table, the top row indicates the agent and the left column indicates the patient, right? Because that's not fully obvious from the labeling. I mean I would like to but I'm not sure I have the time, I'm going to university on Saturday. I might make a start (start and Excel spreadsheet maybe) and come back once I've settled into uni life, but don't be surprised if it doesn't work out. That was partly a thing on my part: I did take quite a bit from T1 in the construction, but tbh I think I'm taking even bigger hints from Numesur and Tsemehkiooni, and I actually hint in the page for PM that it may actually have originated from further south. Er, no it's meant to be the other way around, should really sort that one out. But then I am kinda strongly attracted to overhauling the whole family/proto-language and basically starting afresh though, so things may not stay this way for long (and also another reason why I might not want to take on the T1 reconstruction), probably with the intent of pulling it away from that and maybe a bit more towards Rompian. OK so I've begun the table with my first correspondance! I'm missing the Teyetáti and Tked data though, the former because the link to the PDF is broken (because Dropbox) and the latter because there's no information available yet (to the point where I'm considering just ignoring it for the purposes of reconstruction). 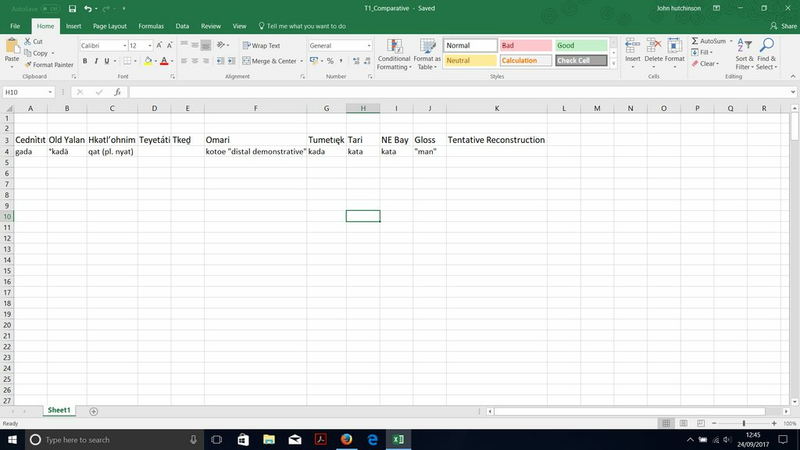 What would be really nice though would be to use data from their proto-language instead of having separate correspondences, avoids the possibility of me positing a form to proto-T1 when it is only found in those two. Also the Omari cognate is highly tentative but it's the closest I could find in the lexicon. You don't have to start at zero though. Have a look in this thread (which you've already posted in! ), and note that there's a link to this spreadsheet where a good number of possible cognates has already been compiled. OK maybe trying to pick apart the pronominal prefixes first was a mistake (I mean wtf is going on with those things!). I'll put that down and maybe do a bit of work on the vocabulary first, and think up ideas for that Proto-Muyn revision. First impressions though: There is a core of morphologially conservative languages consisting of Hkətl’ohnim, Teyetáti, Omari and Tumetıęk; within said group there appears to be a consistent distinction between past and non-past tense subject marker sets, which the languages all share reflexes of and should probably be reconstructed to the proto-language. Further comments will have to wait however until the sound correspondences have been worked out, for which I will consult the lexicons (so somebody had better sort out that link for Teyetáti). OK after looking it over it is clear to me that I need a good deal more experience, though I do have some ideas for some sound correspondences which I'll put into the document. The presence of the descendants of Old Yalan really clutters up the table though, is there a reason for them being there? I think you will be ok with just Old Yalan correspondences. Although the morphological cues might be slightly outdated. Looks like it's been longer than I was aware of. WY and EY were made public in August 2012. A year later, in August 2013, a user named Muyam made an effort to reconstruct their common ancestor, but the reconstruction of T1 was still going at a slow pace. So, in November 2013 I started making bits of Old Yalan public. Almost four years have passed without a significant progress. Could someone get that Teyetáti lexicon back up please? Because I could really do with some more input from that language. I should probably also see about adding more Tari to the table. I should probably (finally) get back to Tkeḏ sometime this weekend…it'd be nice to revisit T1, one of my favorite projects. Thanks for the link, but there is a problem: all the words in the PDF appear to be in the table already, and of the etyma for which there are gaps (of which there is an abnormally large number) there is no word for that at all in the lexicon. Not just "the word for it in the lexicon for that is not cognate" (which I could accept if you proposed it as the result of an intense contact situation, or large amounts of semantic shift), but there is no word for that concept at all, and these are pretty fundamental words like "big", "old" and "know". Hi guys! After a looong break from conlanging, I am trying to get back into the swing of things, and thought that I should do a bit of work on ARN so that it can at least be useful in the Proto-Ronquian reconstruction. I have added another ~30 words to my incomplete Swadesh list, as well as added the two suppletive ordinals: ŋʷok 'first' and qa-zo 'second', as well as the three bonus words r̊ʲaʃri 'necklace', rʷokʲi 'chief' and rʷobʲat 'house of the chief'. Also, the word for 7 was phonologically illicit and has been changed from kroʃʲe to qroʃʲe. OK, so I think I'm gonna have to give up on Muyan in its current state, so I think I want to have the pages deleted and replaced with something else. I'm thinking I might want to replace it with a language I already have worked on called Keṭ Lixuem [kɤʈ lexɯ̯əm] (examples here). I didn't originally intend it to be spoken on Akana, but at the same time I have no other ideas for a Muyan replacement, nor any desire to start a new conlang right now. So, I've been thinking, maybe we should try seeing if /r/conlangs on reddit is up to reconstructing proto-T1? Also, as an aside. Been working on the syntactic stuff, hope it helps with whoever eventually works on the reconstruction. Unfortunately, there hasn't been much activity lately, but that doesn't mean this project is dead. You are more than welcome to join us. There seems to be some server issues with the wiki; I've been logged out and I'm having trouble logging in again, as the login page isn't loading.